The Spellman High Voltage Electronics Clean Tech Competition is an international research and design challenge for 15-18 year old pre-university students. This is an educational opportunity for students across the world that challenges students to be innovative while encouraging their passion for the sciences and we want all the eligible students in your school or organization to participate this year! Registration is open and waiting, but only until March 16. In 2017, there were 26 nations involved. So far 17 different nations have signed up teams: the Bahamas, Bulgaria, Canada, China, Egypt, Fiji, France, India, Indonesia, Ireland, Jamaica, Moldova, Singapore, South Africa, Spain and the United States. This is a wonderful opportunity for the high school students in your country to show the world they’re capable of changing it for the better! I want this to be an opportunity for the high school students that your school or organization serves to show their knowledge and passion for STEM to the world as we try to solve the very real issue the world is facing: Climate Change. Now is the time to tell your teachers and spread the word to students so they can gather their teams and get ready to register! They don’t have to submit their papers yet, but in order to be a part of the Competition, they must be registered before March 16. Late registrations will not be accepted. There is no limit to the number of teams per school/ organization either and I hope to see many registrations thanks to your efforts. Teams consist of 1-3 students, are assisted by a Team Leader (i.e. parent, teacher, or mentor), to develop a written proposal. 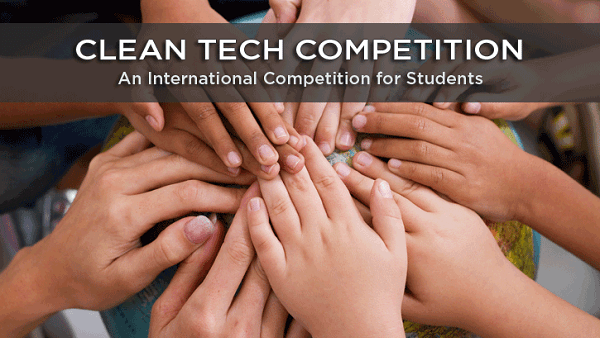 Teams of 1-3 students from anywhere in the world may participate. All participating students must be 15-18 years old on July 12, 2018, the date of the final competition. Sorry, but students enrolled in university, older than 18 years, or who graduated high school (or the local equivalent) are NOT eligible to participate. If you have any questions regarding the competition details, or how to incorporate the competition into your curriculum, please contact us. Also, please be sure to review the Official Rules and Regulations of the Clean Tech Competition.